Image 16.5 x 11.5 cm. Folio 20.5 x 15.7 cm. A distinctive body of Rajput paintings in a seventeenth-century Mughalesque style have been linked to the court of Mandi. The works are identified as being by the Early Master at the court of Mandi. 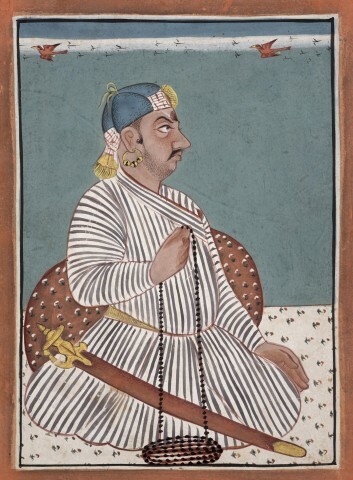 It is known that Raja Hari Sen of Mandi (r. 1604?-37) had his portrait painted in the Mughal manner of the Jahangir school and the Takri script inscription on the painting names Mandi as its source. The style cultivated in the court atelier, by the Early Master of Mandi, continued under the reign of Hari Sen's son Suraj Sen, who is depicted in the current portrait. Since the current painting does not follow the Mughalesque style favoured at court at the time, the work would apear to have been produced a a posthumous portrait, by one of his descendants. 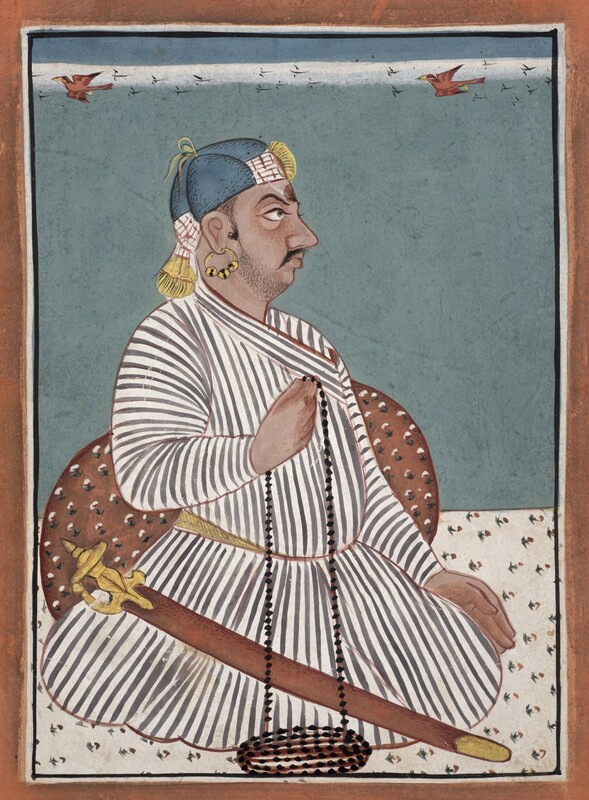 Several sets of posthumous portraits of the Mandi rulers are known to have been produced at the court, but it is not known under which ruler the current work was produced. Some scholars have suggested that the large format parrots seen flying in the sky of several Mandi portraits, point to an earlier 18th century date but this remains a subject of debate.